More women than ever are working or filling part-time jobs, leaving behind mounting household chores, according to the study “Overworked and Underemployed” published in The American Prospect. Without the ability to focus on maintaining laundry, groceries, dinner and bills, both men and women are now working around the clock. The study certainly doesn’t suggest that it’s women that should be at home doing the lion’s share of household chores, only that the dramatic shift from a dedicated homemaker to dual-working families has created a time deficit. Whether a family is made up of children and single parents, double income earners or a part-time wage earner, mothers are more harried and stretched than ever with little time to recharge. What “Overworked and Underemployed” doesn’t tell us is how to reclaim a work-life balance. But there’s no big secret involved. No one is going to give you permission to take a breather and clear your mind. It’s up to you to take control over your own life and find the work-life balance you badly need and deserve. Carving out enough time to create your own work or income earning opportunity isn’t necessarily out of reach. It simply means you need to prioritize your time and make sacrifices somewhere else. This may mean skipping an hour online or watching a favorite show at the end of the night in favor of getting up and running with your business idea. You can start with an established business opportunity like Amway and connect your existing network with goods they already need. Entrepreneurs who already run a business as a personal shopper or style consultant can also use the products as a means of residual income. Another option is to expand on the skills you already have, such as copywriting or project management, and solicit extra work through sites like Upwork or around your community. Even earning a few hundred extra dollars a month can free up enough income to invest in a house cleaner or landscaper. As your business starts growing, look at working from home full or part time and leaving behind your stressful day job. It’s easy for you to succumb to a stress addiction and feel you can tackle the world. But chauffeuring around the kids, keeping the home running, working on a side business and getting up at the crack of dawn to commute to your day job is a recipe for disaster. What’s not easy is asking for help when you need it. Admitting you need someone else isn’t as simple as picking up the phone and asking. Make a list of what you actually need help with and available solutions. For example, your partner may need to assume more responsibility with running errands. Meanwhile, your colleagues or mentors can offer insights on how to get your business off the ground. Remember paying for help is also an option, whether you’re outsourcing tasks to a virtual assistant or hiring a personal assistant for the day to sort through files. 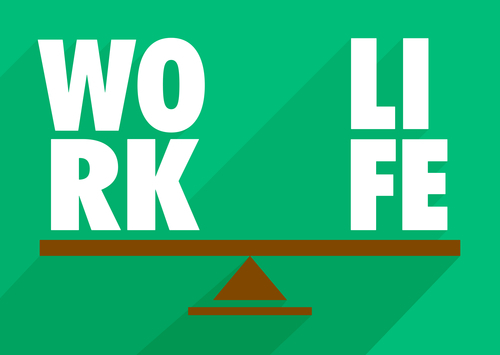 Remember the “why” behind your quest for a better work-life balance. Your family needs regular time with you and vice versa. Transferring the stress of work and chores to constantly worrying about balance achieves very little. Instead, schedule in dedicated and focused family time when you leave work, worries and stress behind for a set amount of time. The more you learn how to separate your work from your personal life, the more you realize that’s the real beauty behind the work-life balance.